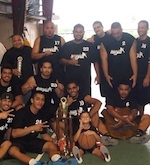 The American Samoa Under-19 Boys and Girls Basketball Teams participated in the 2009 World Youth Basketball Tournament held in Kona, Hawaii from Aug. 1-6, 2009. American Samoa has been invited to participate again in 2010. ASB Inc. President Ed Imo explained that the Tournament hosted eight high school teams in both categories from Alaska, Canada, Kona, Kapolei (Oahu), Maui, Kohala, Florida and American Samoa. ASB U19 Boys are: Tino Tuilata, Herotise Fau, Rhine Samuelu, Ryan Samuelu, Talanoa Smith, Posala Ailolo, Puna Silofau, Gabriel Puaina, Faima Tua, and Onosaimeatiga Tovale. Coaches are Tony Aetonu and Dave Lemisio. ASB U19 Girls are: Geraldine Neru, Pauline Von Dinklage, Valerie Sasa, Pamalyeen Von Dinklage, Theresa Tuiavii and Vatau Fanene. Coaches are Tagiilima Ripley, Paul Von Dinklage and Haili Ripley. Participation in WYBT was a culmination of year long ASB Inc. clinics and development programs. We are happy with the U19 results at the WYBT. This is a good indicator that our ASB Inc. program is on cue for stateside competition. We will use WYBT as development competition for the 2011 South Pacific Games in New Caledonia. Head Coach Tony Aetonu and ASB U1-9 Boys played hard to take fourth place. Six courageous young ladies, under Coach Tagiilima Ripley, captured a respectful fifth place. Aetonu recognized that the WYBT was an excellent opportunity to gauge skill levels of our local high school players. The AS Boys proved competitive after their win over the team from Whitby Canada, winning by one point. Another positive indicator was the local boys win over the Kohala Jazz team, who were the Division II, Hawaii state champions. Both teams also gained popularity after a cultural performance of a mauluulu and faa taupati siva during the tournaments opening ceremony. ASB Inc. Member-Representative, Leilani Ripley and Paul Von Dinklage, a chaperone, accompanied the teams on their travel to Kona. Ripley shared that spectators and WYBT committee members complimented the players for good sportsmanship and respectful attitude, both on and off the court. We now have a good understanding of the WYBT program and are already planning for 2010. WYBT will be used to gain more stateside competition experience for our youth, as well as to help them prepare for college ball programs, said Ripley, who is also founder and president of the AS Women in Sports Association. Two of our young ladies are in the process of submitting sports vitaes to the Pacific Island Athletic Allaince. Ed Imo conveyed his gratitude and appreciation to the Safe and Drug Free Schools and Community, ASG Department of Parks & Recreation, American Samoa Telecommunications Authority, GEAR Up American Samoa, the American Samoa National Olympic Committee and AS Department of Education for partnering with ASB Inc. this summer. Our sincere mahalo and faafetai tele to the Samoan community in Kona, Hawaii: Mativa Tupe, Prince Tupe, Tara and Tony Palepoi, Ropati and Shana Tualaulelei, Peu Tofili, C. Toofili and Tupu Pagofie, Sone Apineru and Louisa Smith-Hemphill from Hilo.